A new generation of CharlieCards would be part of the next-generation fare-collection system, the transit authority said. Massachusetts Bay Transportation Authority officials want to eventually phase out using cash to pay on board its buses and trains, allowing riders to use their cellular phones, credit cards, and new CharlieCards instead. The change would not take effect for at least two years and would need approval from the authority’s fiscal control board. But at Monday’s board meeting, MBTA officials said they plan to aggressively pursue a new fare-collection system that would be more user-friendly and speed up boarding times. They have said the new system would eventually cost less and make it more convenient for customers to pay. However, some worry the shift could disproportionately affect low-income riders, who typically use cash more than higher-income customers. Riders would not be able to use cash to pay for bus and train rides. But they could still use cash to load sums onto a new version of the CharlieCard at vending machines and other retail locations. Riders could also tap a credit card on a new fare box or buy a ticket on a smartphone. 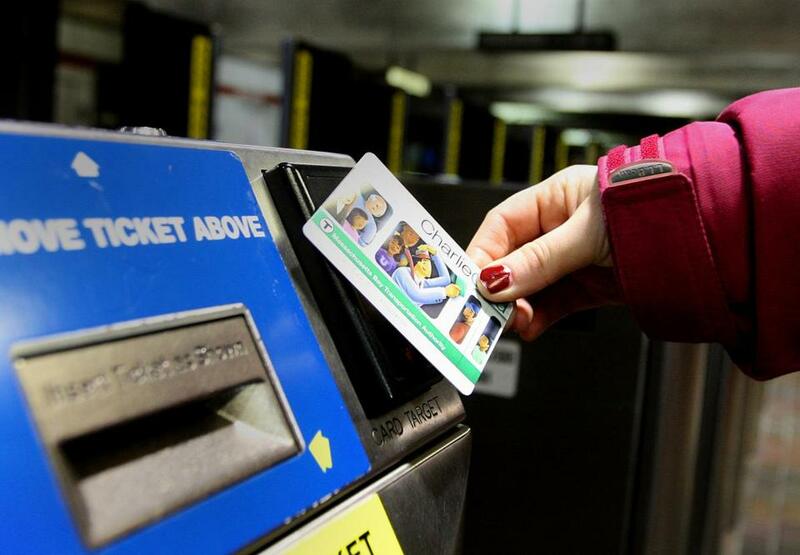 Officials plan to solicit bids this spring for a new fare-collection system that could be in place two years after a contract is awarded, said David Block-Schachter, the MBTA’s new chief technology officer for consumers. Some advocates said that MBTA officials need to make sure they pay attention to low-income riders who may not use credit cards or smartphones. “There is a very real population for whom buying a [CharlieCard] with a credit card or putting substantial money on a stored-value card is a burden, and they have to be protected,” said Paul Regan, executive director of the MBTA Advisory Board. Block-Schachter said more sales outlets would be needed, such as at retail stores, along with more vending machines at key transit stops. Officials did not immediately respond to questions about how many people currently use cash to pay on trains and buses. But spokesman Joe Pesaturo said the MBTA would take into consideration whether all riders would have access to vending machines. “The MBTA would only implement such a system if at the same time there were a substantial expansion in the ability of riders to purchase cards WITH CASH at key bus stations and in numerous locations in neighborhoods with a high proportion of low income users,” he wrote in an e-mail. Stephanie Pollack, the state’s transportation secretary, said the new system’s cost has not yet been estimated, but the state believes it has enough money to implement such a program. The MBTA would be following the lead of other transit systems, such as Transport for London in the United Kingdom and the Chicago Transit Authority. Such a fare-collection system would allow the T to easily charge different prices for different times of day, or for different distances traveled by a customer. Some agencies experienced major glitches when they switched fare-collection systems. In Chicago, for example, many riders encountered errors after the switch to Ventra, an open-electronic fare system, according to news media reports. The MBTA acknowledged there could be problems, especially since it wants to move quickly with a two-year schedule. Block-Schachter said the timeline was based on how quickly Chicago was able to make the change. Officials stressed the new system would be easier to manage. Block-Schachter told the board that some of the current fare boxes on buses cost “more than most cars” but the newer fare-collection technology would cost a fraction of that. A vending machine costs about $45,000, and a fare-collection box on a bus costs about $30,000, Pesaturo said. The MBTA already uses mobile ticketing via smartphones on the commuter rail system and on ferries. A smartphone pilot program launched in 2012 will become permanent this year. A new fare system would mean the end of the current CharlieCard, which debuted in 2005, it would be phased out about six months after the new system is live. It’s unclear whether paper tickets currently available at vending machines would be valid after the transition. Pesaturo said that would depend on the proposals from the companies that are seeking the fare-collection contract. At least one control board member seemed surprised by the MBTA’s proposed timeline. Brian Lang said officials had previously said the change could take up to five years. Other members of the board seemed eager to make the switch soon. “How do we make this go faster?” Joseph Aiello, the chairman, asked Block-Schachter. “Than this?” replied Block-Schachter, referring to the two-year timeline. “As fast as possible,” Aiello said.